It doesn’t matter where we are. Or how far we’ve travelled. Or how hot it is. Or what time of day. Whether it’s time for a snack, a meal, a nightcap, morning tea or midnight feast. We can always drop in to Red & Pilchard’s Ultimate All-Australian Travelling Café! … and serves up food just the way we like it! Like food from our favourite bakeries. Or even good, old fashioned home-cooked meals. But Red and Pilchard’s Ultimate All-Australian Travelling Café isn’t open to just ANYONE! Its exclusive membership deals are just for two! BUT … there’s an occasional dispensation for a special guest, or a mate. And the best thing about Red and Pilchard’s Ultimate All-Australian Travelling Café? Against a fascinating and ever-changing backdrop – tropical, desert, coastal, inland, rocky, sandy, scrub, bushland, beach, mallee, lakes, rivers – the Café provides an oasis of stability. Because no matter how dramatic the changes to scenery, weather or company, the Red & Pilchard’s Ultimate All-Australian Travelling Café Chairs have remained the same for nearly a decade. So whatever adventures we’re having on the road, we come home to Red & Pilchard’s Ultimate All-Australian Travelling Café. They’re not even close to being worn out yet, so if you’re out on the road and you see them (and us! ), why not drop in and see if the Cafe’s open?! « 7 Days … from Adelaide to Darwin! I like the way you managed to get bakeries into this story too! Part of camping that we like the most is eating! Everything tastes better when you are not in your own home, but outdoors. Our fifth-wheel RV was our only home for over 10 years…home was always the same, but the back- and front-yards were always different! So much fun. I was sure I left a comment about how comfy the chairs look. @Valladolid DP – Thank you!! It was fun doing this post – it brought back many happy memories!! @eileeninmd – The travelling cafe’s further adventures may well be highlighted here at a later date!! Watch this space! @Jerry – Thank you so much!! I’m honoured!! @Mary – They are such great looking chairs that most grey nomads on the road have the exact same ones! And yet, the manufacturer has now made a new model that’s much less comfortable and doesn’t fold down so small! Go figure!! @diane b – You are WAY better off visiting the cafe just after a bakery run!! Blogger seems to apply random text sizes to whatever I put in. But will try. 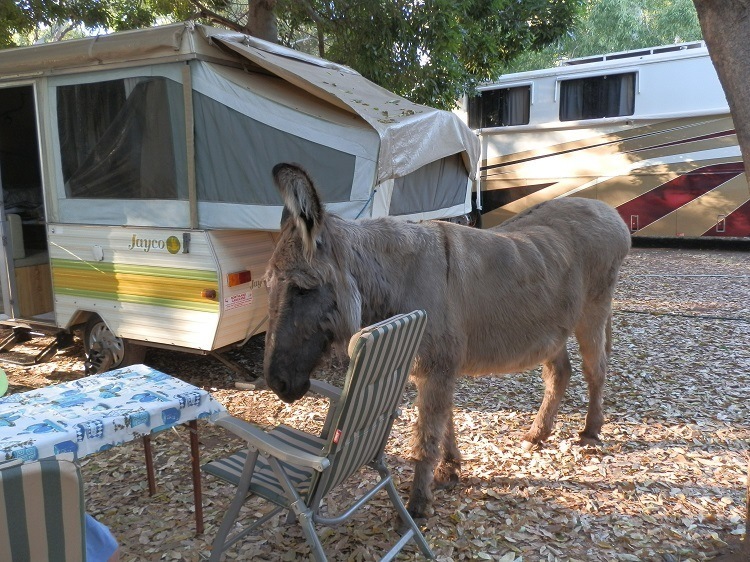 @TMWH – While we’re travelling, I refer to the campertrailer as ‘home’ without even thinking about it!! We’ll be devastated when the chairs fall apart – they’re the most comfortable camp chairs I’ve EVER experienced! @Celine & Phillippe – Happiness is made of these simple things! @Carole – It’s the first time I’ve ever seen fish roadkill!! But that didn’t detract from the marvellous setting – one of the best free camp sites EVER! Blogger must hate you – I know it does me from time to time! Like your choice for the theme day. The first one is my favourite. 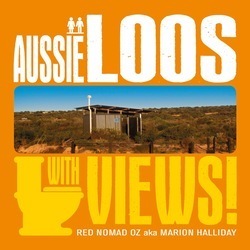 “Amazing Australian Adventures” has been included in the A Sunday Drive for this week. Be assured that I hope this helps to point even more new visitors in your direction. Hahahahah…. cute Cafe!! Seems even the wild creatures like it. Must of smelled something tasty. Your pop up looks like the one I had many years ago. Loved it!! Great post, I like your idea of the traveling cafe. Wonderful scenery and gorgeous photos. Have a great day! load of fun to be sure; a wonderful lifestyle you have created and made the most of. 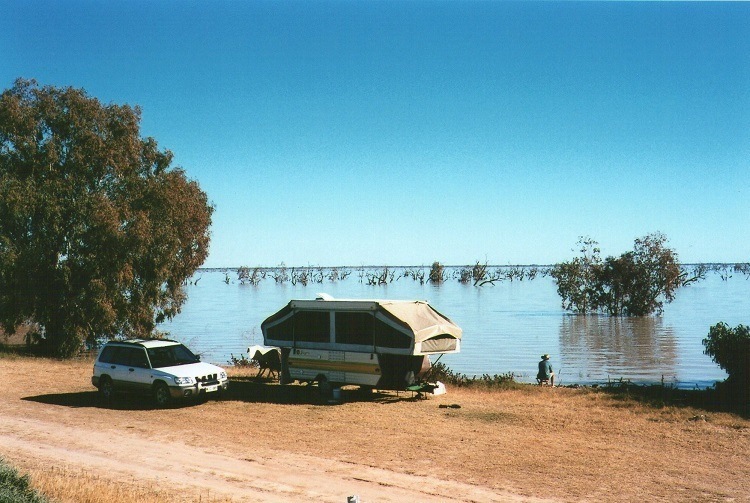 Was it smelling somewhat ‘fishy’ around Menindee while you camped there? All the drying out carp laying around?? That’s how it was when I visited May ’12; enchanting place, I’d have loved to spend more time photographing but was on a whistle-stop coach tour. Didn’t see this come through my reader though; wondering why blogger did that to me? Home is where breakfast is served,eh? Those chairs look comfy! Very original idea for the theme day. I wouldn’t mind visiting that cafe it has gorgeous and diverse views. I would choose a day when the owners have just been to a country bakery. Do you think you could make your text bigger for us oldies with poor eyesight. Red, you’ve found some terrific places to pitch your tent with great scenery in all directions. Even your “visitor” looks friendly. Great collection of photos. I’m very impressed with the changing decor of your cafe. But I’m glad you’ve kept the chairs — they really look comfortable. @ladyfi – Well … it’d probably have to be modified for Sweden! @Jo – It works for us!! Have a great weekend! @George – The chairs are the best for appreciating the ever changing scenery! Oh – and the bakery food!!! @Filip – The outdoor cafe isn’t for everyone – but everyone will probably find at least one spot to their liking!! @TFG – Thank you!! It’s always a pleasure compiling a post like this – as I sort through the photos, I’m blessed with many happy memories! @Kath – HAha, if you can track us down, you’re welcome!! But you’re better off finding us just after a bakery buyout … just sayin’! @Manzanita – HAha, everything travels, but that’s a GOOD thing, right?!?! Love ya back, girlfriend! @SFlaGuy – The good thing is, it’s all DIY!! Or maybe I should patent it … I’ll be interested to see what YOUR cafe looks like!! @sonia – Welcome!! Strange that the donkey only seemed to come around at mealtimes!!! But it made our stay in Wyndham memorable!! @LONDONLLULU – HAha, these are the results of several roadtrips! And better a donkey visiting than, say, a snake or crocodile! @Dina – Yes, I’m SOOOOO lucky! Why don’t you join me sometime?! @Joan Elizabeth – It’s perfect because EVERYTHING is geared towards what I want!! @Alessandra – As you know, it’s the only way to get exactly what you want! We eat out, but usually the view from the chairs is fantastic! @Tanya – So do I! @Saucy Kod – Pyromaniac Pilchard would add ‘campfire’ to the list of cafe ‘must haves’!!!! And yes, that IS him fishing! @Hilda – I’m glad I inspired you! Make it happen, girlfriend!! Sorry for all the whrittin mistakes. Even in frech. fautes de frappe ! When I was young… very long ago ! I almost whwnt to australia. I had to go to the ambassy in geneva, to inquire. Bur, the doors had been always closed. On’s to *les recemcement* ( conting people) , Another time, it was a celebration ! Well I had urge to live my parents. So I went to London, witch I like very match. When i do camping, it is trought France, Spain and Stwitzerland, to gold panning competitions. I Sleep in my big Ford .car. By the way, we might had met. Wow! Love the idea of travellings café. Just amazing Wyndham Caravan Park. I’d like to book a seat at your cafe some day! I have to agree with Dina—you have the best café in the world! ha, the travelling cafe, love it! This is not the type of traveling we like but nature looks fantastic and love the visitor. Now that’s the best kind of cafe! Looks delightful. This would be the cafe and the chairs I would choose from all the world, if I could. Tres exclusive Red, ten years you say, these are the best travelled chairs today.. When I change my blog from South Florida Guy to All Over the Place Guy I will need one of these rolling cafes. Everything gets to travel. I read about the pants, then the rocks and now the Cafe and chairs. Glad you are enjoying the outdoors. The best bit Red is the ever changing view, plus you always get the table that you want and no long waits to be served. I am hoping to hit the road again later this year. What a great take on the theme. Chairs by a caravan .. the perfect cafe.